Michelangelo’s sculptures are among the world’s most precious works of art. Significantly, this includes his unfinished sculptures, which have more value than many of the completed marbles showcased in our museums. Why do they have so much more value? We cannot answer this question by describing their perfected qualities, as we might describe the life-like curves and proportionality of Michelangelo’s “David.” There are no such qualities in these cases—they’re incomplete. 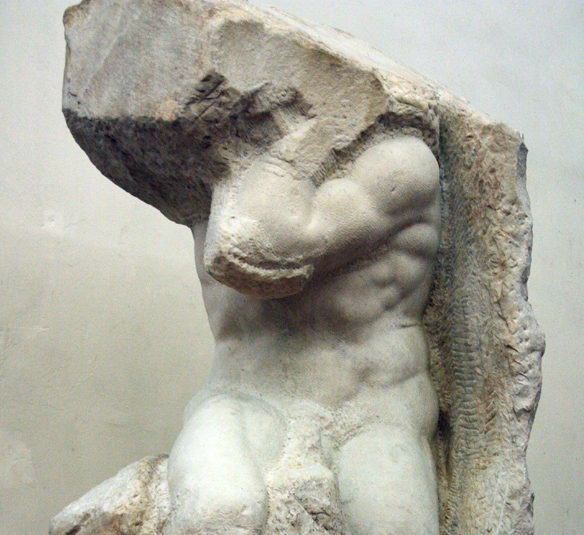 (In fact, today’s amateur sculptors could reproduce the rough stages of the marbles left by Michelangelo.) The immense value of his unfinished marbles must therefore depend on their simply being, well, Michelangelo’s. Their greatness derives from his greatness; they partake of his glory, as it were. Now suppose a museum procurator destroyed these marbles simply because they were unfinished. How would the world react? Some would classify it as a “crime against humanity.” And perhaps it would be. How is it, then, for many today it’s a crime against Humanity to destroy a man-made marble, but an undoubted moral right to destroy an unborn human being? Our society’s failure to feel horror towards abortion stems from its failure to identify preborns for who they really are, i.e., divine works of art still in the process of completion. As with Michelangelo’s sculpture, the child’s worth does not depend on being fully formed. (Is the three-year old fully formed? Is the thirteen-year old?) The child’s value depends, rather, on being “fearfully and wonderfully made” by God. As divine works of art, preborns bear the stamp of their Creator. As bearers of His image, they are partakers of His glory. This is what Christians have always meant by “human dignity.” We all have moral worth, such that we ought to be valued by others even if we are not valued. Moreover, our status as divine image bearers gives “sanctity” to our lives; it confers moral immunity from being arbitrarily harmed or killed by others. How tragic to think that society feels shock at the destruction of an incomplete block of marble, but only apathy toward the destruction of a human life, the highest and most valuable work of art ever made. If we are to protect these little lives, we must recapture the Christian perspective on what it means to be human. But it’s equally important for our arguments to be accompanied by our actions. The two must form a united front. This is why I thank God for the clarity, courage, and compassion of ministries like Expect Hope. May we all learn from their example.